Hi there and happy First Day of Spring to you! We have been having some beautiful spring like weather here and the plants and flowers in my yard are beginning to bloom. I just love this time of year! 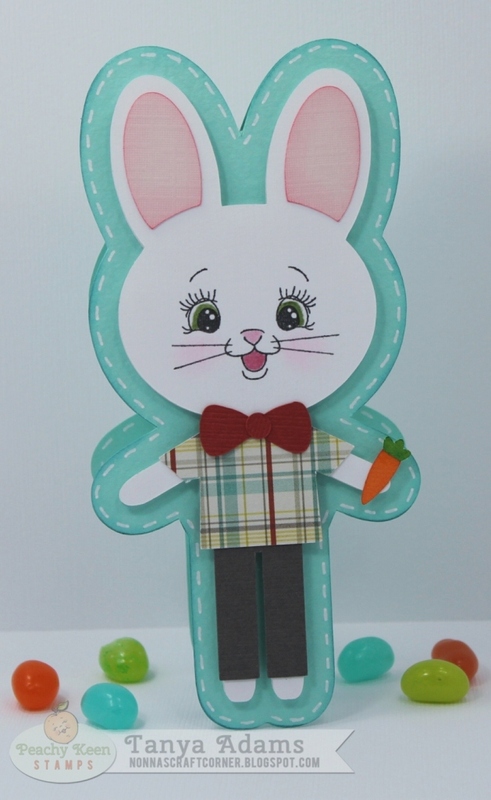 * This cute little bunny is from the Silhouette Online Store. The file is called "Randy the Rabbit". I used the Offset Feature to create a card base so that I could make a shaped card. 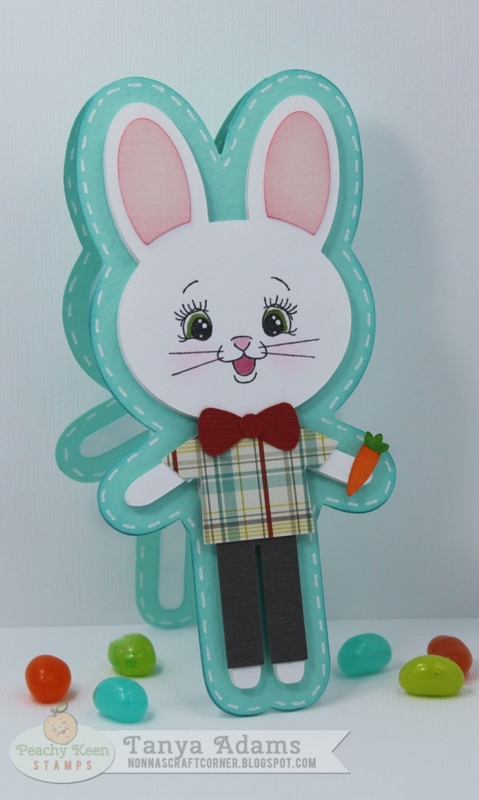 * His sweet little face is from the Peachy Keen Stamps "Baby Easter Bunny" set PK-193. I inked up just the face features on the baby bunny, stamped them onto Randy's face and colored them with my Copic markers. * I used pop dots to adhere Randy to the card base and finished off my card with some stitching lines from my white gel pen. Thanks so much for stopping by today - I hope you have a wonderful First Day of Spring! love it! even the color choices you made! SOOOOOO cute, Tanya!!!! Love this so much!! This is the sweetest card ever...love it!!! Tanya, your little bunny card is so cute! I love the PK face you've used (gotta get that set). The colors are perfect! Happy First Day of Spring to you too!! Adorable!! Love your shaped card! It is just too cute! So cute! Love the striped shirt and bow tie! Adorable! What a handsome bunny!! Your GS will love this! I love the plaid shirt and that BG blue is gorgeous!! Awesome job on your sweet Easter card! Tanya ~ Isn't little Randy just the CUTEST little card EVER! I just LOVE his little outfit ~ too CUTE! Then of course the face! I think Blake is going to ADORE his card! Okay as for the weather ~ PLEASE send some our way! So cold and windy! My poor card today went flying through the yard! The smart one here ~ thought don't bother putting shoes on ~ your only going to be out there for a minute or two! LOL! Sorry I LOVE your card! He's so cute!!! I love the papers you used and that spiffy bow tie. How cute!! Love the lil "outfit" he has on!! His face is adorable!!! Adorable! 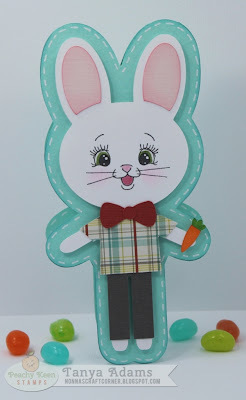 I love this card, its so cute, with his little outfit:) Thanks for sharing! He is a Cutie Patootie!!LOL! !Love it! What a fun image! I love the look of the tall rabbit with his spiffy attire! Super face too! I needed a bunny face stamp today. I'm jealous of yours! What a fun shape card. Blake will find this adorable. The aqua background happens to be one of my favorite colors right now. The faux stitching was a lovely addition!